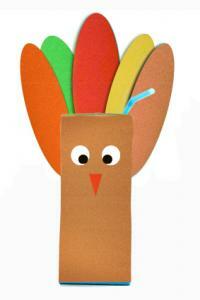 Thanksgiving activities for preschoolers can be meaningful, easy and fun. Start by talking to preschool children about the meaning of Thanksgiving and engage them in conversation about what they are thankful for. Once children understand the concept of gratitude, Thanksgiving activities come naturally to them. 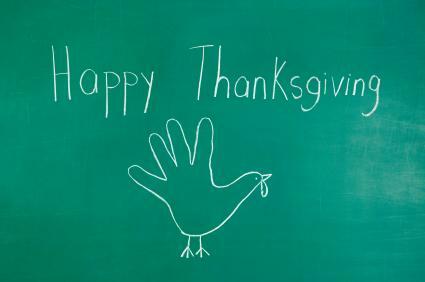 As Thanksgiving planning begins, let preschool children help. They love to do activities to make the holiday memorable. 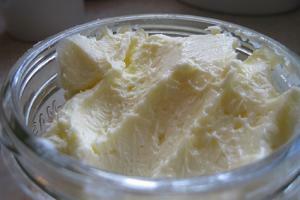 Children will be proud to serve butter they made themselves to Thanksgiving guests. All you need is cream, salt, and a lidded mason jar. Add one-half pint heavy cream to a mason jar; close lid tightly. Shake, shake, and keep shaking the jar, the faster, the better. After 15 minutes or so (depending on how hard you shake the jar), the cream will thicken and form butter. Drain any remaining liquid, which is buttermilk, and put butter in the refrigerator to harden. Kids love clay. They'll love it more if it smells like pumpkin pie and they're allowed to eat it. This edible dough recipe is from About A Mom. Put one cup canned pumpkin into a mixing bowl and stir in two ounces honey. Add two cups flour, two cups powdered milk, and one-half teaspoon pumpkin pie spice; mix until moistened. Knead dough on floured countertop or in mixing bowl, adding flour as needed, until you get the consistency of bread dough. Add red and yellow food coloring until the dough is orange. Let preschool children help make a quick Thanksgiving treat! 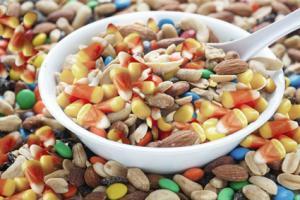 Mix cashews, peanuts, M&Ms, and orange and yellow candy corn in a large bowl. Fill nut cups or treat bags for guests. This is a 'no sticky mess' activity and gives an opportunity for children to feel helpful. Substitute dried fruit for the candy mixture for a healthy snack. This activity is adapted from the Iowa Corn Promotion Board. It should be done a few weeks in advance so that by Thanksgiving day, the corn is already growing. Wet a paper towel and wring out the excess water. Place six kernels of corn in the center of the paper towel. 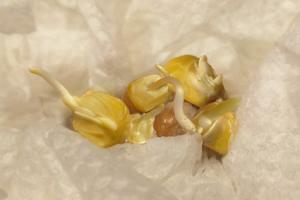 Put the paper towel and corn kernels into a Ziploc bag with the corn kernels showing; close the bag. Lay the bag in an area that receives direct sunlight. Check the bag each day to see how the corn is growing. If the towel is dry, water the corn until damp. This activity promotes empathy for animals and a fondness of nature. Collect large pinecones outside; tie a piece of twine or yarn around the top of each pinecone for hanging. Place pinecone on a paper plate. Using a spatula, cover the pinecone completely with peanut butter and drizzle with honey. If you don't want to deal with a sticky mess, omit the honey. Pour birdseed into a measuring cup for easy pouring and sprinkle over the pinecone so that the seed sticks to the peanut butter. Press bits of dried fruit and chopped nuts into the peanut butter. 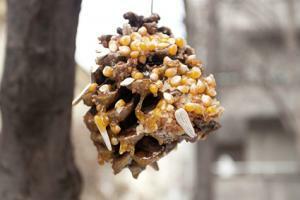 Hang the pinecones from trees or bushes to provide "Thanksgiving dinner" for the birds. This activity helps kids recognize what they're thankful for. Gather a selection of magazines, greeting cards, etc. Have children cut out pictures of things they are thankful for. Design the collage by arranging pictures on a piece of construction paper or poster board. Once the collage is designed, glue pictures onto the paper or board. Embellish with sequins, stickers, markers, etc. 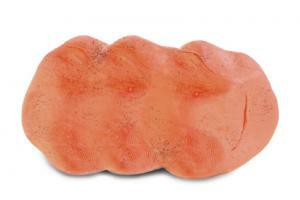 This activity from Juicy Juice is great for the kids' Thanksgiving table. Measure the height and width of a juice box and let kids cut brown construction paper to the appropriate size. Glue brown construction paper to the juice box and let dry. Cut feather shapes out of red, orange, green, and yellow construction paper and glue to the back of the juice box. Glue googly eyes onto the juice box. Use construction paper to cut out a beak and waddle and glue them onto the juice box. Alternatively, kids can draw the eyes, beak and waddle onto the juice box. Collect leaves of various colors, shapes, and sizes in the yard. Leaves should be pliable and not dry. Cover a table with newspapers; add various colors of paint to a paper plate. Paint each leaf, making sure the entire leaf is covered. Press the painted side onto a piece of construction paper. Lift the leaf to see the print. This cute craft from Origami Owls will help everyone know where to sit at the dinner table. Purchase black plastic cups, large or small. You can typically find these at a party supply store. Cut out a circle out of black construction paper about one inch larger in diameter than the lip of the cup. Glue the cup to the circle; let dry. Cut out a buckle shape from yellow or orange construction paper; glue onto the black cup. Write each guest's name on the cup's brim. 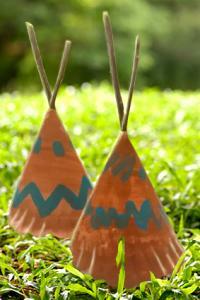 Use extra paper plates to make these cute teepees from Fantastic Fun and Learning. Cut a paper plate in half and decorate each half with paints, crayons, colored pencils, or markers. Fold each half into a cone shape and staple or glue the ends together. Push two or three popsicle sticks or small sticks through the top of each cone, leaving an inch or two showing. 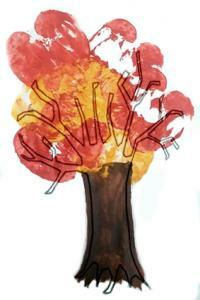 You can make this fall tree early in the season to help usher in the Thanksgiving spirit. Draw the trunk and branches of a tree on a white piece of construction paper. Halve a few apples (one half for each paint color) and pat them dry. Dip each apple half into paint and stamp "leaves" onto the tree branches. Paint or stamp the tree trunk brown. This is a classic craft that never goes out of style. Shred pieces of fall colored tissue paper (red, green, brown, yellow and orange) into three-by-three squares. 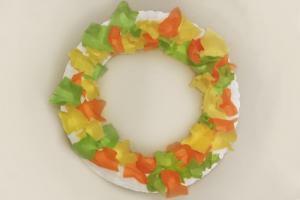 Cut the center circle out of a paper plate and discard. Paint or color the remaining plate circle, if desired. Crumple tissue paper pieces and glue onto the paper plate. Add a bow if you like and attach a ribbon for hanging. Have kids collect food for the food pantry. Showing preschool children the act of giving and sharing is an easy activity to do while you are running errands. Let children pick two cans of a favorite food to donate and praise them for being so generous. Likewise, consider collecting winter items such as hats, gloves, and scarves to donate to a winter shelter. 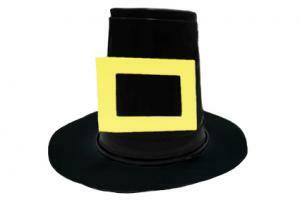 Visit the library for Thanksgiving books on Pilgrims and Indians. 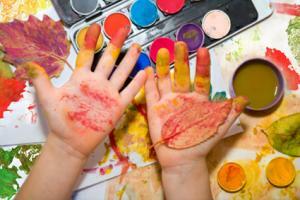 Each time your preschool children make Thanksgiving crafts or participate in an activity, they create memories. Providing your child the opportunity and means to play an active role in your Thanksgiving preparations helps educate them on the meaning and history of the day and creates traditions to be treasured.